I’ve written a few Chinese Fakeaway recipes over the past few years but this one has been requested many a time and I’ve never got round to reworking it. Well good news…. now I finally have!! I’ve tested this recipe a few times now and tried a few different cooking methods but this one is my favourite. If you prefer the chicken a little more crispy you can toss the raw chicken in 1 tbsp of corn flour and half the spice mix before the first fry (this will make the dish 5sp per person). You can also cook the chicken coated in half the spice mix and corn flour in the oven for 20-25 mins on 180c (spray with 1kal) and then add to the cooked veggies and continue from there. I like the method I’ve gone with below as it keeps the chicken nice and juicy!! The use of spinach and lime aren’t a traditional addition but I think the spinach bulks the dish out nicely (if you aren’t going to serve with rice) and the lime adds a lovely freshness at the end. I served this as it was without any rice but I served the hubbies with a 60g portion of egg fried rice (6sp) for a grand total of 10sp. Begin by toasting the salt flakes in a dry frying pan until they start to brown (this will only take a few minutes). Then, in a small bowl mix the toasted salt, ground black pepper, white pepper, 5 spice, sugar, garlic powder and chilli flakes together. Next take a large wok or frying pan, spray with 1kal and add the chicken with half of the spice mix. Fry for 8-10 minutes until the chicken is cooked through (add a little water if the pan gets a little dry). Once the chicken is cooked through and golden, remove from the pan and pop on a plate to one side. Spray the pan with 1kal again and fry the onion, peppers, spring onions (reserve a few spring onions to dress at the end) and half of the remaining spice mix until the onions start to soften about 5-6 minutes). Once the onions have started to soften add the chicken back to the pan with 1 tsp of sesame oil. Taste and then add more of the spice mix to the pan as required/to taste. Stir fry for a few seconds and then add the soy and honey to the pan. Toss everything together then add the spinach and beansprouts. Stir fry for a few more minutes until the spinach has wilted. Serve topped with a sprinkle of spring onions and a squeeze of fresh lime juice. Made this tonight , the way you like best – definitely a winner in this house . Made this last night, it was lovely. Might back off a little on the 5 spice next time! Wow didn’t think Chinese could be so hot. This is as hot as a madras curry. Loved the recipe but will need to turn down the heat somehow. Going to get something very cold now. I cut the chilli down to 1/4 tsp. It was on point – I have made this about 4 times now …..
Is this something you think you could eat cold? Just made this, my mouth is on fire! Husband said it tasted exactly like the Chinese though; impressed! I made this last Saturday, omitting the sugar and the honey and it was still delicious. I am making it tonight – with the same omissions – but this time with beef fillet that I have flattened between cling film. I expect this Chinese dish, with chicken or fillet, will be my go-to recipe – it is so delicious. I made this again on Friday but with sugar snap peas instead of spinach and [flattened] chicken breast strips instead of beef fillet. My husband and I absolutely loved it! This will be a definite favourite! This is one of my absolute favourites! I’ve never ordered salt and pepper chicken before, and now there’s no need to. I always bulk it out with extra vegetables – it’s a great way to use anything that’s nearing the end of its life! This is your best recipe yet. So simple to make, but absolutely delicious. Thank you. 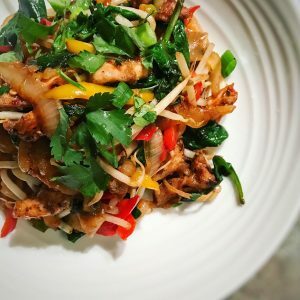 Really tasty recipe, it was a bit spicy for me but the less nesh members of my family said it needs to be one of our regular meals. Delicious……just sat down to this for the second night in a row. Hubby also loves it! No need to order takeaway when you can make this so easily. So glad you both enjoyed Alison! Thanks for another fab recipe ! I made this last night for me and hubby ,we really enjoyed it . It was very spicy which we enjoy . I made 3 of your recipes last weekend and now this one . My hubby doesn’t normally eat ‘WW’ food but it’s been a great success as he’s eaten all 3 of them !